Banks Power Products for Dodge Gas Trucks will start you off with the best possible power improvements while retaining the same reliability. Of course, the more power your engine puts out, the greater the wear and tear. But that's what's great about American manufacturers - they know you want more power, so they design their engines for power and let you decide how much extra wear and tear you want put on your engine. Starting with a Monster Exhaust System, you can retain your factory specs and reliability while decreasing exhaust back-pressure by 88%. This will pump your hp, torque, and fuel economy upwards while managing exhaust heat better than a stock exhaust. 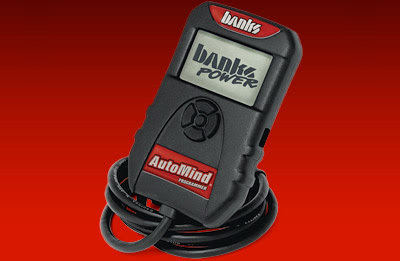 Add their AutoMind Tuner, and you can reprogram your ECU to anything from max power to max fuel economy settings. Also, you can read your engine error codes, adjust your shift firmness, remove your rev limiter, etc. By incorporating a Banks iQ Display, you can make these modifications on-the-fly without having to shut off your engine - great for alternating between towing, everyday driving, or long-distance applications. Also, the Banks iQ Display will do everything that a Palm PDA can do, so you can watch movies, view your Microsoft Office documents, utilize your satellite navigation - pretty much everything a Palm Pilot can do except browse the internet. You may be wondering about other components currently offered by Banks that aren't offered for this make/model pick-up. As for your intake system, your best bet is probably just dropping a fatty K&N Filter. Reason being, Banks probably tried to create a Ram-Air intake system for Dodge gas applications, but most likely didn't find any significant performance improvements with an intake housing. In other words, Banks always has you covered on the basics, and shame on you for asking. If you have any further performance modifications to make to your pick-up, Banks will work with your custom job to make sure you get the best possible results. Want to incorporate their components when you've already custom installed a Garrett turbo on your Dodge gas pick-up? No problem, just give them a call. Their technicians are ready to answer your questions, and are available Monday through Friday anytime during normal business hours.